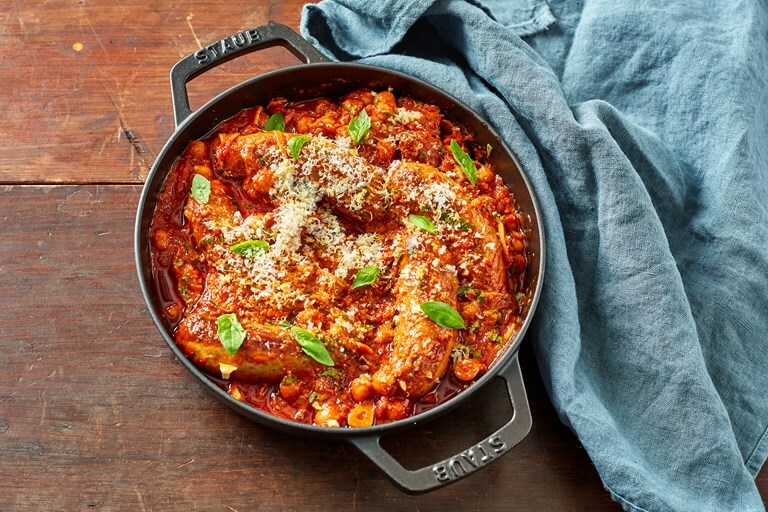 This rich and comforting sausage ragù recipe is a a feast for the senses, packed with flavour from chickpeas, chorizo, tomato, paprika and, of course, good-quality Italian sausages. Luke suggests serving the ragù with focaccia and a glass of red wine for maximum enjoyment. Add the parsley to the ragù and stir. Squeeze in half of the lemon (without the zest) and place the ragù in the centre of the table. Splash over a final touch of olive oil and sprinkle liberally with the garlic, lemon and Parmesan mixture. Grind over a twist of black pepper and eat with fresh focaccia and red wine. Sit back and enjoy the life you have for five peaceful minutes!